Jellies under-13s won 16-14 against Fareham Fireflys Lilac in a very exciting contest. Both teams showed their quality. 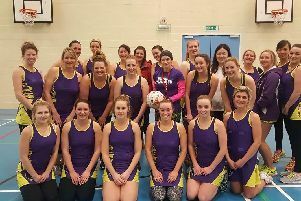 The Fareham All-About Netball League match had plenty of drama. It was a really tough game for Jellies against Lilac. Still recognisable their new pink and blue kit, Julie Parkinson’s squad took an early lead. Encouraged by the ever present parents supporting them from the sideline, Parkinson’s girls increased the goal difference to 12-6 at half-time. Some great play by Katie Toogood, for Jellies, finding space and using great drives onto the ball made it easier to progress down court to goal. Lilacs responded with a great third quarter closing the gap by two. Bulou Butucama was also key to the charge of her team, Fireflys. The final quarter saw Jellies staying strong with huge pressure from Lilacs but holding on for the win at the final whistle. Also at under-13 level Sarisbury Allstars beat sister team Comets 16-2. Tia Watkins was on top form. Allstars were this new club’s first team as they continue to grow with the possibility of even more teams next season. 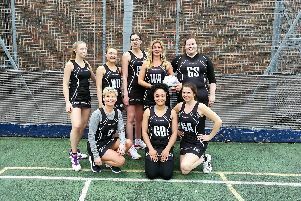 Fireflys White continue to impress as they beat Gosport Gators Emerald 30-7. Holly Lewis, for Fireflys, must have one of the highest work-rates on court in this division. She was deservedly awarded player of the match. Never giving up, Lewis fights for every ball and turns many in her team’s favour. Amy Kempsford was player’s player for Gators. In the under-12s Teamforce firsts proved tricky for Sarisbury Galaxies and won 15-6. Galaxies made a big push at the end and won the last quarter. Little Devils, have won the hearts of the sideline supporters as they make their way to court with bibs bigger than some of their players. They scored a valuable goal this week against Firefly Yellows who took the win 29-1. Gators Jade beat Fireflys Jade 8-2. In the under-14s Fireflys Ruby continue to dominate their division with this team who are also in second place in the Regional League. They beat one of their own teams, Emerald with a massive 27-5 score. Grace Goddard was players’ player for Emerald. Jellies also played on top form, beating Teamforce thirds 26-2. Devils had a good run out against Fireflys Pink, beating them 27-5 with captain Grace Stanley named as players’ player. In the under-16s Gators Green beat Fireflys Lime 15-11. Flo Breeze was one of the stars for Gators. Devils Red beat Devils Black 25-16 and Fireflys Orange beat Fireflys Blue 24-23.